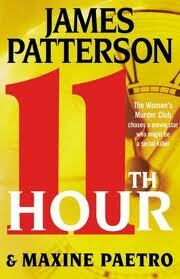 My Series Sunday pick is 11th Hour, the 11th book in the Women's Murder Club series by James Patterson. Lead character, Lindsay Boxer, is pregnant. But that doesn't slow her down. Her detective work is just as demanding as ever. However, this time the killer could be one of her closest friends or co-workers. Within the first 35 pages, readers are introduced to a hidden garden with two severed heads, cryptic numbers on index cards and a shooter (possibly a cop) that killed his fourth drug dealer. 11th Hour was better than the last couple WMC books, but still not quite at par when the series first began. If you'd like to keep up with the series, then borrow it from the library.